My premise for this blog was put to the test this week. I had an entirely different post planned (don’t worry, you will get to read about my fabulous and fast brunch ideas this coming week!). Work was all consuming this week and we had a small dinner party planned with two close friends at our home for Friday evening. Friday morning arrived and I had done none of the grocery shopping for dinner. I was contemplating canceling dinner as another full day loomed ahead of me. Luckily, I have an amazing husband who asked for the grocery list and saved me from the drama of a Friday evening in a packed grocery store. I was able to pull the dinner together because I had done some planning. 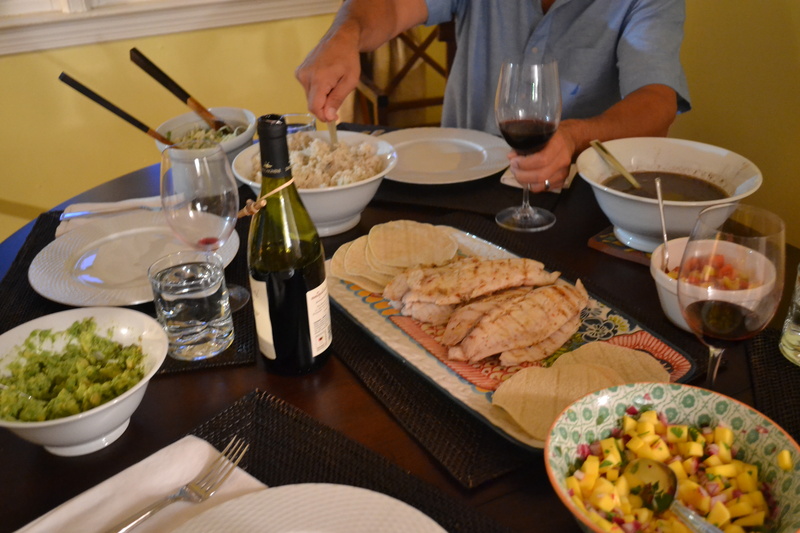 The weekend before I decided we would grill fish for tacos, with Cuban black beans and rice on the side and a gluten free blueberry crisp for dessert. 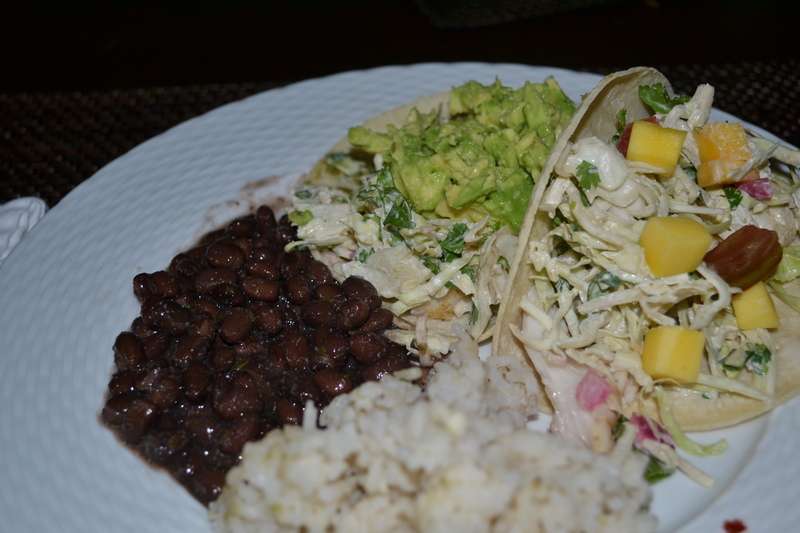 This is a very simple meal that includes some staples I have at home. I gathered my recipes from many different places. Bon Appetit had a base recipe for the slaw, I made up the fish marinade from scratch and experience, a dear friend from Cuba taught me the beans and rice spice combination years ago, and another blog I follow, Bakerita, provided the inspiration for the blueberry crisp. On Friday evening I flew through the door at 5:30 and started furiously preparing the meal I knew we weren’t going to finish on time. As I started my prep, I realized that I didn’t plan for pre-dinner snacks. I remembered that I had some great cheeses on hand: brie cheese, a truffle infused soft cheese, and blue cheese. I assembled them on the cheese platter I featured last week with some gluten free crackers I always keep in my pantry. Our friends were bringing wine, so that was covered (they brought over a bottle of J. Lohr Seven Oaks cabernet sauvignon 2012, a wonderful wine). Dinner wound up being served about a half hour later than I had planned; no one but me noticed. Our guests were having fun sampling the cheese and wine pairings, and our great conversation reminded me what hospitality is all about: fellowship not deadlines. The Three C’s help demonstrate how I made this wonderful night a reality! Combine blueberries, honey, and starch in a medium size bowl. Set aside. Combine almond flour, oats, honey, baking powder, and salt in a separate bowl. Once fully combined, using your hands to work in the coconut oil until clumps form that can be pressed into a crust. 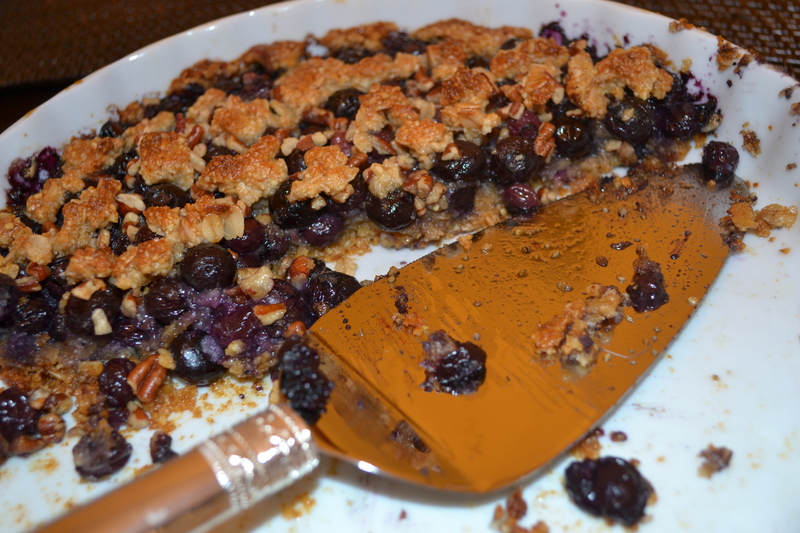 Remove a heaping 1/2 cup of mixture and reserve for topping the tart. Press remaining crust mixture into the bottom of the pan or dish. 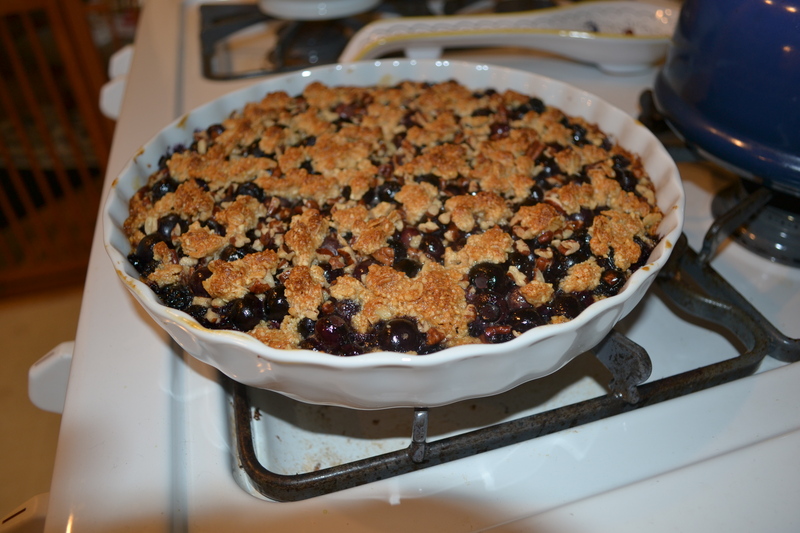 Pour the blueberry mixture over the top until crust is completely covered. Sprinkle the chopped pecan’s over the top. Finish by crumbling the set aside crust mixture evenly over the top. Bake for 40-45 minutes. If you like a dark and crisp top like me let it bake all the way through. If not you can add a foil tent to the top for the final 20 minutes. Hostess Tip: I like to serve with a little vanilla ice cream or fresh whipped cream. Peach ice cream would also be a wonderful flavor combination. 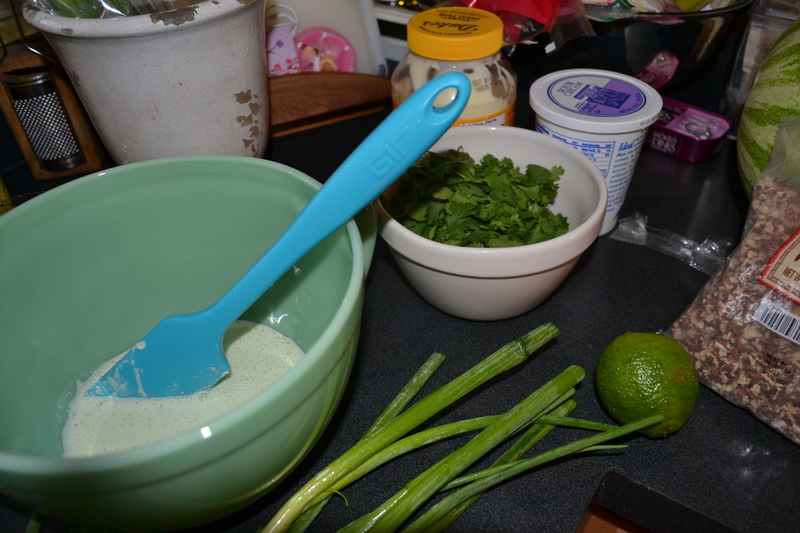 Separate cilantro stems from the leaves and puree the stems (in blender or food processor) with sour cream, lime zest and juice. Pour into a large mixing or salad bowl. Whisk in 1/2 cup mayonnaise, salt and pepper to taste. 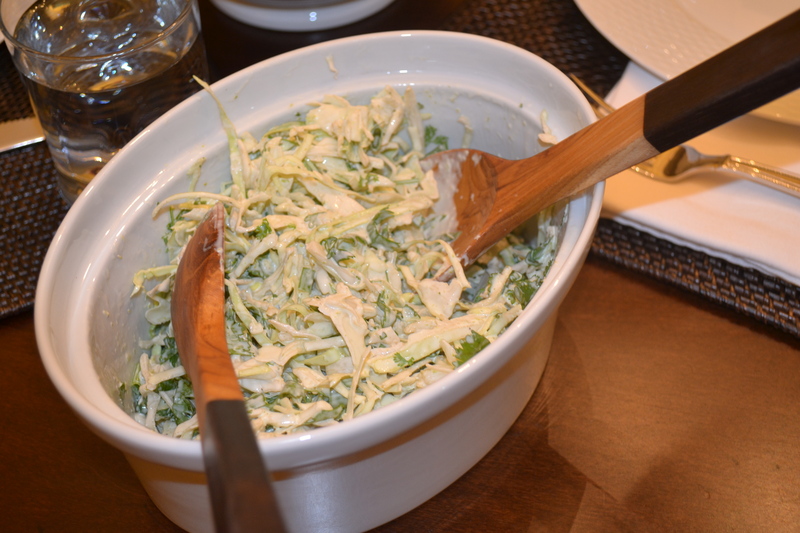 Toss in cabbage, scallions, and coarsely chopped cilantro leaves. Refrigerate if not serving immediately. I recommend not making more than an hour ahead. Place fish in a shallow container that will fit in your refrigerator. In a small mixing bowl combine crushed red peppers, lime zest and juice, cumin, onion and garlic powder, salt and pepper. Pour mixture over fish and refrigerate for at least 15 minutes up to 1 hour. Grill fish just before serving. Pre-heat gill to medium and cook for bout 4 minutes per side. More time if you use a more meaty fish. 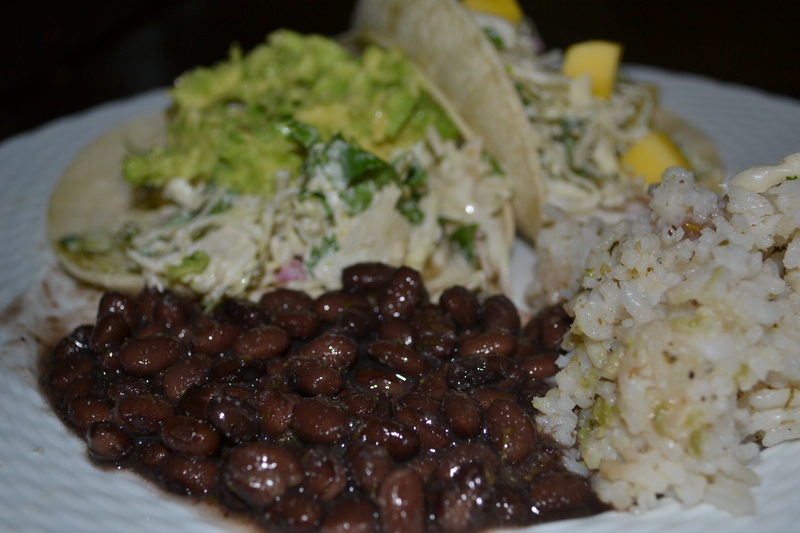 While the fish is marinading prepare the beans and rice. Split evenly the onion powered, garlic powder, basil, and oregano in 2 separate pots. Into one pot add the rice and 4 cups of water. Bring to a boil, cover and simmer for about 20 minutes or until rice is tender and water is evaporated. 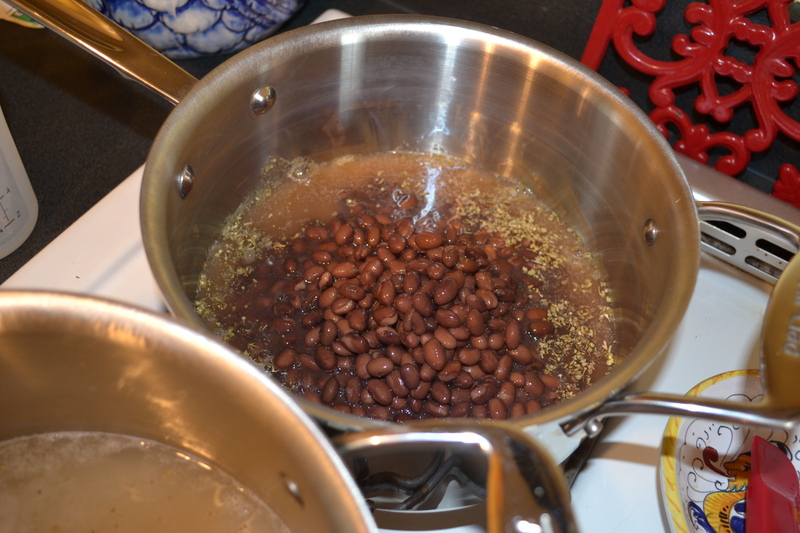 About 15 minutes before you sit down to eat add the black beans to the second pot with spices. Simmer until warmed through. While beans are cooking mash up the avocados and add salt and pepper to taste. Then dice the tomatoes. 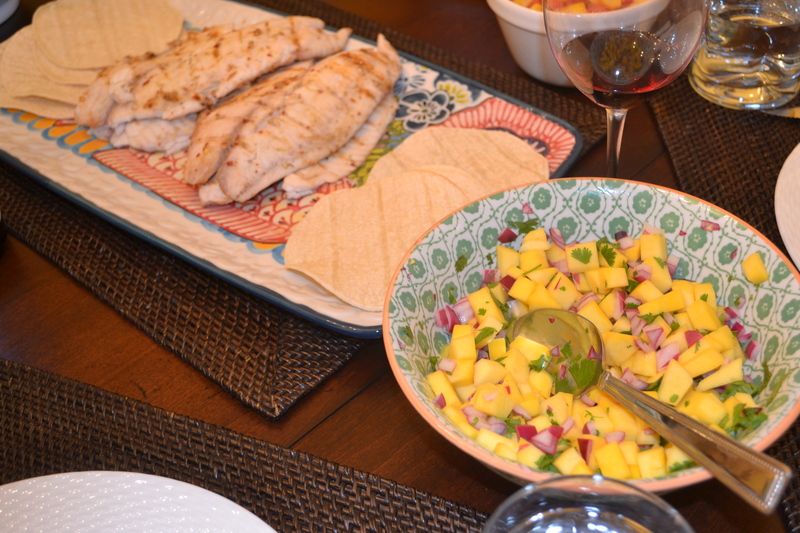 Chop up the mangos, red onion, and any remaining cilantro leaves and add to a bowl with juice of one lime. Place each in separate serving bowls. Finally, heat the oven to low and warm up the tortillas just as you are setting the food on the table. I like to serve my fish on a lovely platter we received as a wedding gift. It is covered with images of fish! I place the fish in the center and the tortillas along the outer edges. When I have more time I like to slice the fish into strips before serving. But, in a pinch, you can serve whole and the fish will fall apart easily. I try to place colorful food in white bowls and the more neutral colored food in colorful dishes. It helps to enhance your guests experience by engaging their sense of site in the dining process. Serving the food family style allows individuals to decide which toppings they would like and allows them to be creative with taste, texture, and site. 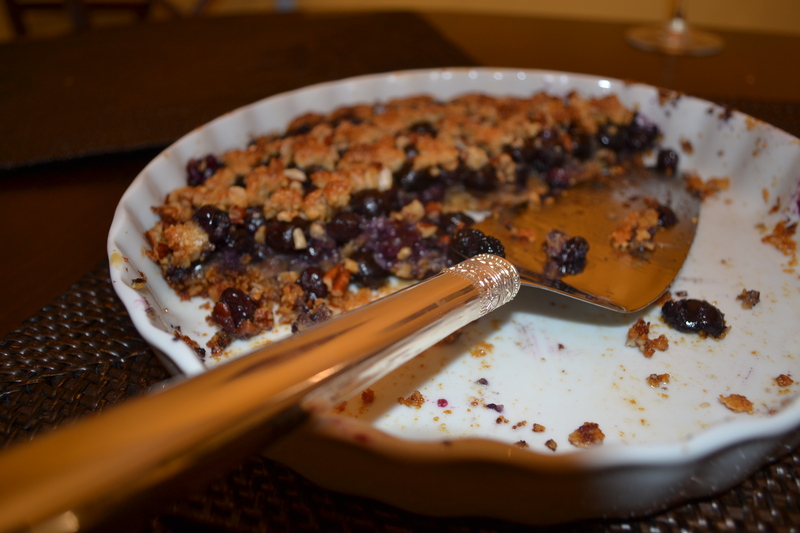 For dessert I used my salad plates which are white to allow the beautiful dark caramel color of the crust and the almost black color of the blueberries to pop! I finished the presentation with a small scoop of ice cream to enhance the flavor. 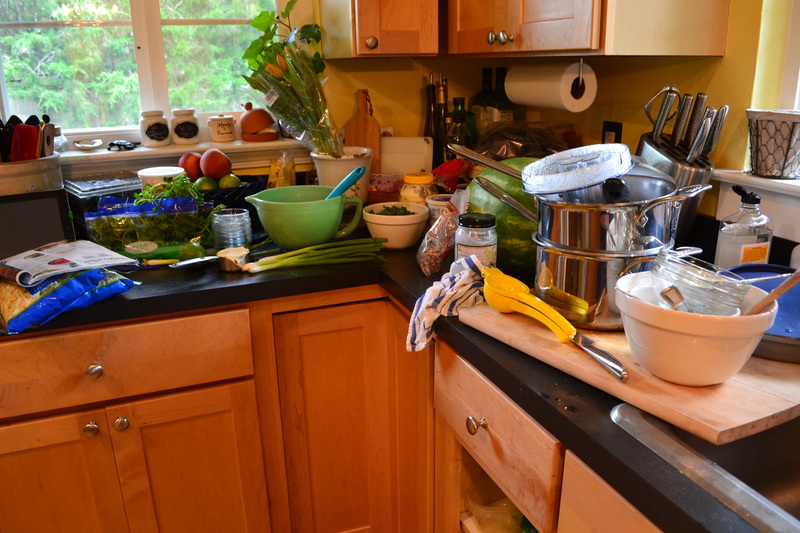 When I wake up the morning after a dinner party the last thing I want to do is get back in the kitchen and cook. If you are lucky enough to have a delicious dessert that isn’t completely devoured the night before, a cup of coffee or tea and a slice of cake or pie is the perfect meal. 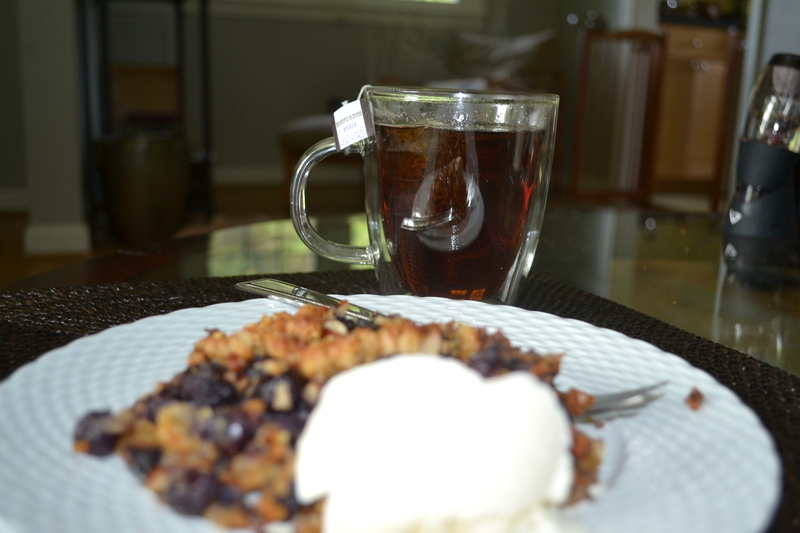 I like to sit in my living room, listen to the radio, enjoy the leftovers with my favorite tea (Harney and Son’s Paris) and reflect on the conversation and memories created with dear friends. I like the idea of pie and coffee in the morning!!! !